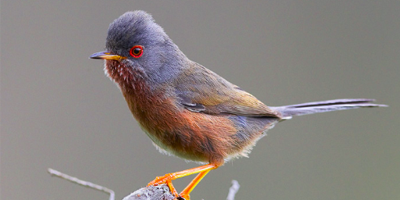 The dartford warbler is a small (13 cm.) warbler with a long thin tail; the males have grey-brown upperparts and dull reddish-brown underparts, except for the centre of the belly which has a dirty white patch; the throat has light speckles and the eyes a red ring. The females are less grey above and paler below. It is a typical bird from the warmer habitats of western Europe and northwestern Africa, living in dense, homogeneous scrub, garrigue and low maquis. It feeds mostly on insects. It is a resident species. The dartfor warbler is a near threatened species (IUCN, 2017), being vulnerable to severe winters, particularly in the northern part of its range, caused by the climate change. The artificial afforestation has decreased the amount of suitable habitat, including post-fire forest management. Too high disturbance from people and dogs can adverse the species. This species recently colonized the site IT4070011 Vena del Gesso Romagnola, that is the only one in the western North Apennine. It is only in the area of the Riva di San Biagio, at the bottom of the southern slope, with a few pairs. Cutting the artificial pine forests in other parts of the site will increase the suitable habitat for the species. Moreover, building log piles (as a result of the forest management) is known to benefit the species.